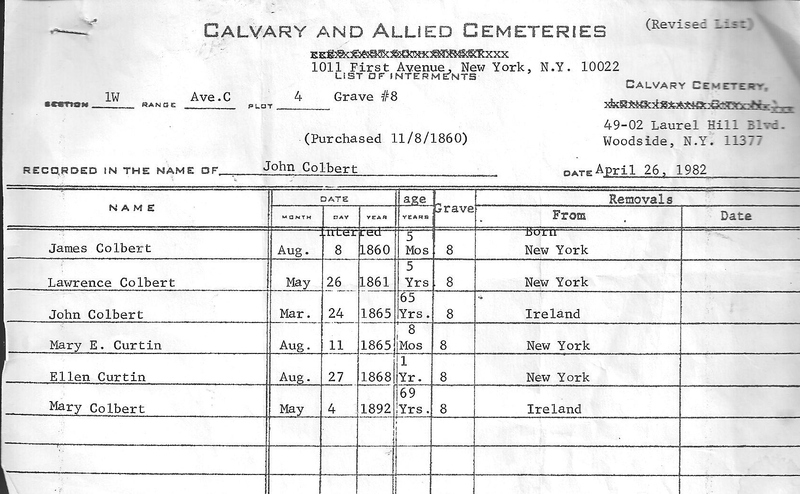 to Calvary Cemetery for a listing of interments in the Colbert family plot. Were Mary E. and Ellen relatives? Mary Coleman had been married before she came to the U.S. Her husband’s name was Martin Smith and they had at least one child, Bridget, who was born in the late 1840s. She came to the U.S. when she was about 3 years old on the Montezuma, with her uncle Larry Coleman. I don’t know why her mother sent her on ahead. Maybe there were other children to care for. Maybe she thought Bridget stood a better chance of surviving the trip if she went with her uncle. It was a tough trip for women and children, especially when they were traveling alone. In the 1855 and 1860 censuses Bridget is living with her mother and stepfather John Colbert. Bridget is 14 years old in 1860. Around 1862 she married David Curtin, an Irish immigrant. They had 14 children, only 7 survived. David and Bridget lived on East 130th Street; according to city directories, David was a grocer. James Woods, a grocer, is a neighbor. He’s also the one who posted bond for Mary Coleman Colbert when she applied for Letters of Administration after her husband died. Around 1894 Bridget’s husband David died. She moved from East 130th Street to 2360 Broadway. Her half brother John, my great grandfather, lived there at the time. Her half sister, Mary Grossman, and her half brother, Garrett, lived nearby. A few years later Bridget married again. Bridget’s death certificate: parents are John Smith and Mary Coleman. Marriage to James Trainor: parents are Martin Smith and Mary Colbert. Mary Coleman is Mary Colbert’s maiden name. I also checked some of the birth records of Bridget’s children and found that she sometimes used Colbert and sometimes Smith as her maiden name. Now, can I find the record for Bridget’s baptism? the marriage record for Mary Coleman and Martin Smith? What happened to Martin? Does Bridget have any living descendants? And why did none of my Colbert relatives know about the Curtins? My grandfather certainly knew them – one of his godparents was an M. Curtin – could that be Bridget’s son Martin Curtin – he would have been about 19 years old at the time.